…as Boz Scaggs sang (as Duane Allman burned on guitar). 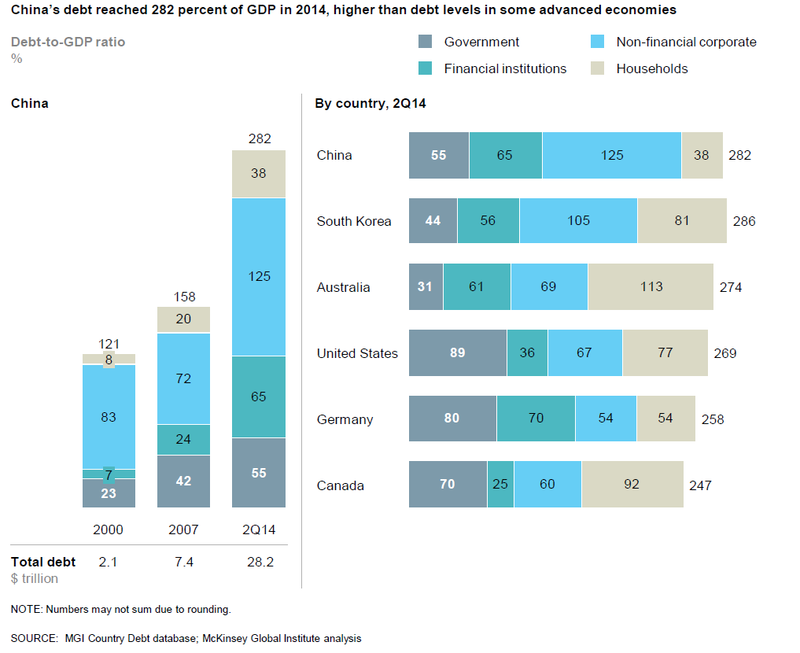 This graph (compiled by McKinsey) shows the levels of debt by sector across several significant countries as a percentage of their GDP. This is the relevant measure because it tells us how much bang countries are getting for their borrowed ‘buck’ (in their home currency). An analogy would be if you were borrowing money on your household account that did not increase your income over time, but instead increased the burden of interest you had to pay on the debt, which would reduce the share of your income for other purchases, like vacations or retirement savings. It makes sense to borrow to earn a degree that will increase your earning potential; it makes less sense to borrow money to take a vacation or buy a car you can’t afford. A rising debt to GDP ratio means the excessive borrowing is not paying off with increased income (national GDP). We can compare countries on the chart below and see that the US has greatly increased government debt, which according to the effects of our monetary policies, has been used to retire private debt. In other words, we’ve shifted private debt, much of it from the financial sector, to taxpayers. Japan is not included, but would show that just government debt as a share of GDP is well over 200%. All this debt has not bought Japanese citizens much in terms of real wealth. One could argue it has just prevented the Japanese economy from imploding. All in all, this is not a pretty picture. Be afraid. Again, a Zero Interest Rate Policy (ZIRP) is a signal of a very sick economy where the time value of money is zero and savings income is driven to zero. It should be temporary. 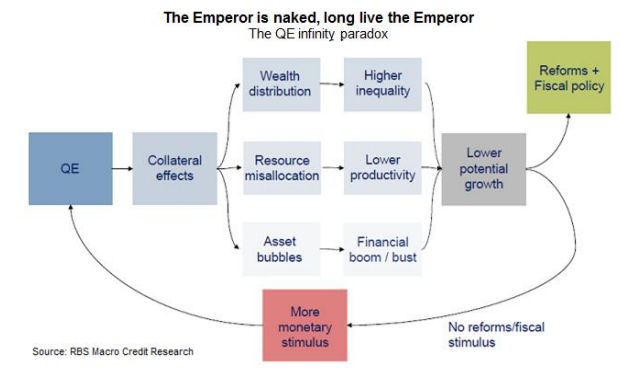 With their policy choices, the central banks are essentially telling us this is a semi-permanent state of affairs. In other words, they have no other tools to jump-start the economy and create jobs. No kidding. Can’t make it better, but they sure can make it worse. If presidential nominee Janet Yellen succeeds Ben Bernanke as Federal Reserve chairman when his term ends Jan. 31 (and I see no reason she won’t), she will inherit a vexing dilemma: To taper or not to taper. The major objection to this kind of policy change is that the “recovery” from the subprime mortgage crisis and economic slump of 2008 is so weak that the economy can’t withstand any increase in interest rates. This general concern with economic weakness is what pushed the Federal Reserve into its near-zero interest-rate trap to begin with—followed by the Bank of England, the European Central Bank and the Bank of Japan. 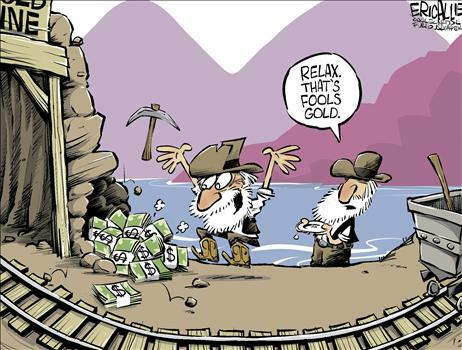 All four central banks have fallen into similar traps and their economies remain sluggish. What is at fault here is conventional macroeconomic theory. First, although reducing high interest rates to more moderate levels is stimulating for aggregate demand, going from moderate rates to near-zero rates has proved far less effective. 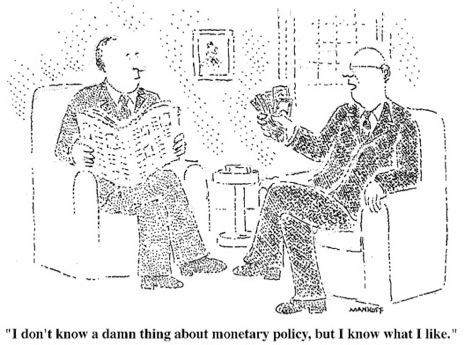 Second, fine-tuning monetary policy to target a nonmonetary variable, such as the level of unemployment, has become an ill-advised fetish. 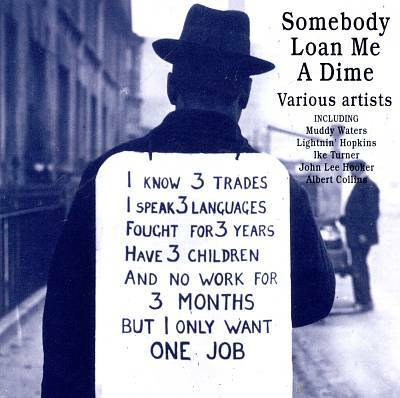 What Milton Friedman taught us in his famous 1967 address to the American Economic Association, “The Role of Monetary Policy,” is that central banks cannot (and should not) persistently target a nonmonetary objective—such as the level of unemployment, which is determined by too many other factors. 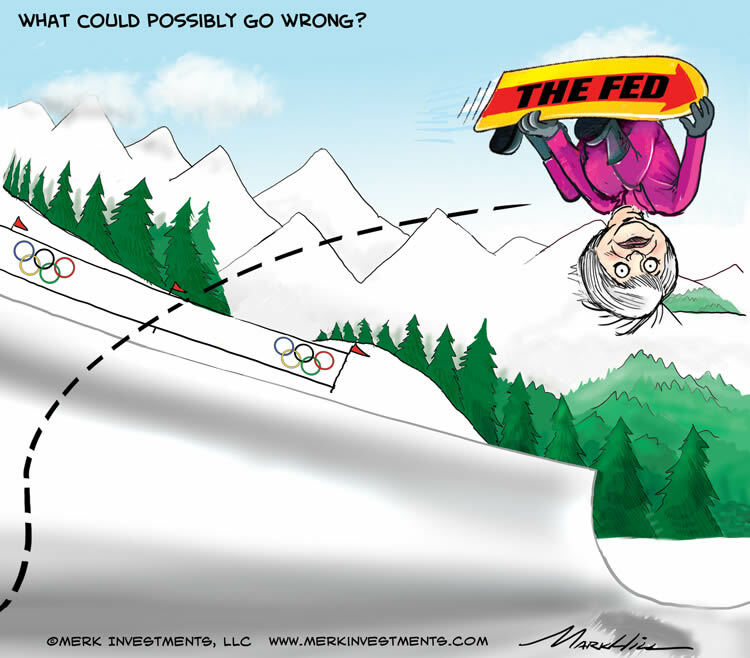 The most straightforward approach now is for the leading central banks—the Federal Reserve (perhaps with Ms. Yellen at the helm), the Bank of England, the Bank of Japan and the European Central Bank—to admit that they were wrong in driving interest rates too low in the pursuit of a nonmonetary objective such as the unemployment level. They could then begin slowly increasing short-term interest rates in a coordinated way to some common, modest target level, such as the 2% suggested here. Coordination is crucial to minimize disruptions in exchange rates. Then our economic gang of four should, in a measured and transparent manner, phase out quantitative easing so that long-term interest rates once again can be determined by markets. What do I want for Christmas? How about Leszek for our Fed Chairman? This is an excellent interview filled with common sense and economic truths (probably the best I’ve read in the past 3-4 years; this is worth ten Greenspan speeches ). Leszek Balcerowicz, the man who saved Poland’s economy, on America’s mistakes and the better way to heal from a financial crisis. As an economic crisis manager, Leszek Balcerowicz has few peers. When communism fell in Europe, he pioneered “shock therapy” to slay hyperinflation and build a free market. In the late 1990s, he jammed a debt ceiling into his country’s constitution, handcuffing future free spenders. When he was central-bank governor from 2001 to 2007, his hard-money policies avoided a credit boom and likely bust. Poland was the only country in the European Union to avoid recession in 2009 and has been the fastest-growing EU economy since. Mr. Balcerowicz dwells little on this achievement. He sounds too busy in “battle”—his word—against bad policy. Looking around the world, there is no shortage of questionable policies. A series of bailouts for Greece and others has saved the euro, but who knows for how long. EU leaders closed their summit in Brussels on Friday by deferring hard decisions on entrenching fiscal discipline and pro-growth policies. Across the Atlantic, Washington looks no closer to a “fiscal cliff” deal. And the Federal Reserve on Wednesday made a fourth foray into “quantitative easing” to keep real interest rates low by buying bonds and printing money. As a former central banker, Mr. Balcerowicz struggles to find the appropriate word for Fed Chairman Ben Bernanke’s latest invention: “Unprecedented,” “a complete anathema,” “more uncharted waters.” He says such “unconventional” measures trap economies in an unvirtuous cycle. Bankers expect lower interest rates to spur growth. When that fails, as in Japan, they have no choice but to stick with easing. “While the benefits of non-conventional [monetary] policies are short lived, the costs grow with time,” he says. “The longer you practice these sorts of policies, the more difficult it is to exit it. Japan is trapped.” Anemic Japan is the prime example, but now the U.S., Britain and potentially the European Central Bank are on the same road. If he were in Mr. Bernanke’s shoes, Mr. Balcerowicz says he’d rethink the link between easy money and economic growth. Over time, he says, lower interest rates and money printing presses harm the economy—though not necessarily or primarily through higher inflation. First, Bernanke-style policies “weaken incentives for politicians to pursue structural reforms, including fiscal reforms,” he says. “They can maintain large deficits at low current rates.” It indulges the preference of many Western politicians for stimulus spending. It means they don’t have to grapple as seriously with difficult choices, say, on Medicare. Another unappreciated consequence of easy money, according to Mr. Balcerowicz, is the easing of pressure on the private economy to restructure. With low interest rates, large companies “can just refinance their loans,” he says. Banks are happy to go along. Adjustments are delayed, markets distorted. The Fed model is spreading. Earlier this fall, the European Central Bank announced an equally unprecedented plan to buy the bonds of distressed euro-zone countries. The bank, in essence, said it was willing to print any amount of euros to save the single currency. Mr. Balcerowicz, who is 65, was raised in a state-planned Poland. He got a doctorate in economics, worked briefly at the Communist Party’s Institute of Marxism-Leninism, and advised the Solidarity trade union before the imposition of martial law in 1981. He came to prominence in 1989 as the father of the “Balcerowicz Plan.” Overnight, prices were freed, subsidies were slashed and the zloty currency was made convertible. It was harsh medicine, but the Polish economy recovered faster than more gradual reformers in the old Soviet bloc. Shock or no, Mr. Balcerowicz remains adamant that fixes are best implemented as quickly as possible. Europe’s PIGS—Portugal, Italy, Greece, Spain—moved slowly. By contrast, Mr. Balcerowicz offers the BELLs: Bulgaria, Estonia, Latvia and Lithuania. These EU countries went through a credit boom-bust after 2009. Their economies tanked, Latvia’s alone by nearly 20% that year. Denied EU bailouts, these governments were forced to adopt harsher measures than Greece. Public spending was slashed, including for government salaries. The adjustment hurt but recovery came by 2010. The BELL GDP growth curves are V-shaped. The PIGS decline was less steep, but prolonged and worse over time. The systemic changes in the BELLs took a while to work, yet Mr. Balcerowicz says the radical approach has another, short-run benefit. He calls it the “confidence effect.” When markets saw governments implement the reforms, their borrowing costs dropped fast, while the yields for the PIGS kept rising. He adds: “Somehow the impression for many people is that increasing taxes is correct and reducing spending is incorrect. It is ideologically loaded.” This applies in Greece, most of Europe and the current debate in the U.S.
During his various stints in government in Poland, the name Balcerowicz was often a curse word. In the 1990s, he was twice deputy prime minister and led the Freedom Union party. As a pol, his cool and abrasive style won him little love and cost him votes, even as his policies worked. At the central bank, he took lots of political heat for his tight monetary policy and wasn’t asked to stay on after his term ended in 2007. Mr. Balcerowicz admits he was an easy scapegoat. “People tend to personalize reforms. I don’t mind. I take responsibility for the reforms I launched.” He says he “understands politicians when they give in [on reform], but I do not accept it.” It’s up to the proponents of the free market to fight for their ideas and make politicians aware of the electoral cost of not reforming. On bailouts, Mr. Balcerowicz strikes an agnostic note. They can mitigate a crisis—as long as they don’t reduce the pressure to reform. The BELL vs. PIGS comparison suggests the bailouts have slowed reform, but he notes recent movement in southern Europe to deregulate labor markets, privatize and cut spending—in other words, serious steps to spur growth. “Once the euro has been created,” Mr. Balcerowicz says, “it’s worth keeping it.” The single currency is no different than the gold standard, “which worked pretty well,” he says. In both cases, member countries have to keep their budget deficits in check and labor markets flexible to stay competitive. Which makes him cautiously optimistic on the euro. Why do some countries change for the better in a crisis and others don’t? Mr. Balcerowicz puts the “popular interpretation of the root causes” of the crisis high on the list. Going back to the 19th century, industrializing economies recovered best after a crisis with no or limited intervention. Yet Keynesians continue to insist that only the state can compensate for the flaws of the market, he says. This Polish academic sounds like he might not feel out of place at a U.S. tea party rally. He takes to the idea. If deficit spending were stimulus, France would be king. Moody’s stripped France of its triple-A rating last week, citing “deteriorating economic prospects,” the “long-standing rigidities of its labor, goods and services markets” and “exposure to peripheral Europe.” And it could get worse: “We would downgrade the rating further in the event of an additional material deterioration in France’s economic prospects,” says Dietmar Hornung, Moody’s lead analyst for France. Don’t think, however, that the French government is unduly alarmed. Finance Minister Pierre Moscovici insisted that the downgrade did not “call into question the economic fundamentals of our country.” We’ve never made a fetish of the opinions of the ratings agencies, which tend to be lagging indicators. Nonetheless, the “fundamentals” Mr. Moscovici points to are worth a closer look. In 1981, when the Socialist government of Francois Mitterrand took office, France’s national debt amounted to 22% of GDP. In the intervening years France’s economy has grown by an inflation-adjusted 73%, while the national debt—now at 90% of GDP—grew by 609% in real terms. In raw numbers, that comes to about €1.7 trillion in additional debt. At no time in those 31 years did any French government balance a budget, much less run a surplus. All this amounts to one of the free world’s longest-running experiments in the real-world effects of stimulus spending. If the fabled Keynesian multiplier really existed, all that spending should have translated into robust economic growth for France. Instead, the only thing that’s been multiplied is France’s debt. President Francois Hollande is now bemoaning the supposed growth-killing effects of the spending cuts being demanded of him by the European Union. Yet if deficit spending could stimulate an economy, France would not be looking over the border with envy at Germany’s growth, debt and unemployment figures. Nor would it again be trying to explain away another debt downgrade. It’s more than just Wall Street – it’s central banks that seek to massage headline economic statistics like unemployment, inflation, and GDP with boundless liquidity. 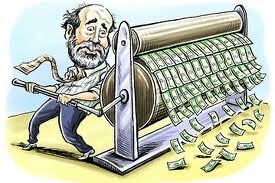 (Bernanke just doubled down again!) But the result has been to increase asset price volatility, creating endless gambles for traders, while providing a taxpayer safety-net for their gambles. It’s “heads we win, tails you lose!” It’s the current politics of finance. We either stop it or destroys our free market system. Our politicians prefer to let it ride. How can we expect stability when volatility increases the value of the instruments owned by the people who make or influence all important decisions? When the global worldwide banking system went into meltdown in 2007-8, the short-term response – the appropriate one – was to use public money to prevent a sequence of collapses of financial institutions. But the right long-term response is not to try to stop future bank failures, but to construct a global financial and economic system that is robust to individual bank failures. That is a fundamentally different objective. Many investors, especially the so-called macro-hedge funds, are positioning for that damned-if-you-do, damned-if-you-don’t outcome to Greece’s election by buying bearish put spreads that will increase in value should global market indexes slump post-vote. Out-of-the-money puts that would increase in value if stock indexes fell 10% or more are extremely expensive. So cautious investors are selling others much further below market levels to defray the high cost of hedging. Yet, many investors and traders are just as afraid of missing a rally, as they are afraid of a sharp decline. They believe that any negative economic development will be met by a government policy response. The Federal Open Market Committee meets Tuesday and Wednesday, and some investors believe that the U.S. central bank will unveil another iteration of quantitative easing that will spark a massive stock rally. It’s a vicious cycle. However, some investors believe that the financial market’s performance, or lack thereof, is a leading indicator of government countermeasures. The more troubling the economic data—and recent statistics have been less than stellar—the greater the potential policy response.